In the previous four sections (in the reference page “Weathering with acrylic washes: basic technique”), I showed my materials and process. 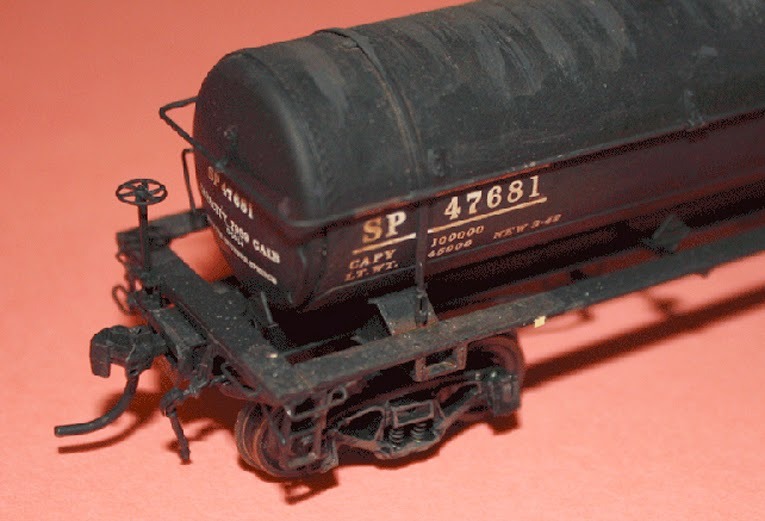 I mentioned in that page that tank cars really cannot be done with my usual two steps (roof, then sides and ends), as there is no “separate” part you can identify to weather differently from the rest of the car, as there is in roofs vs. sides. 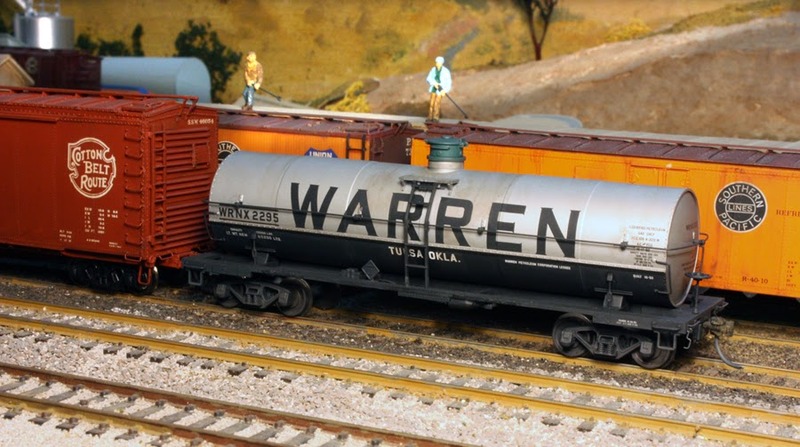 In this section I describe my weathering process for tank cars. 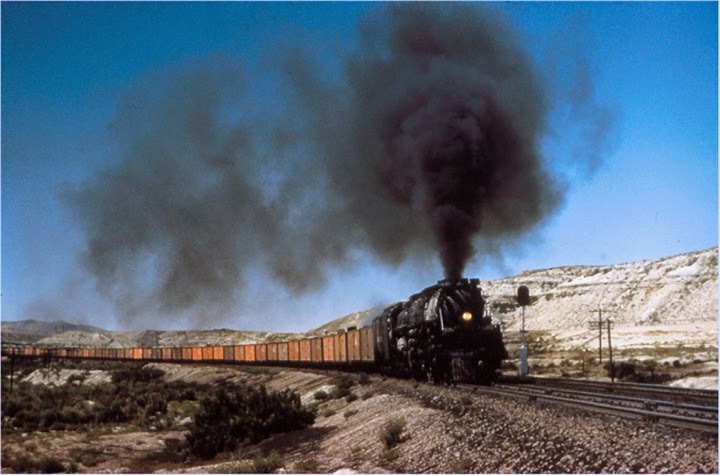 This then is a general summary of my approach to the separate problems of tank cars, compared to house and other cars such as open-top cars. Those are shown in the following two sections. 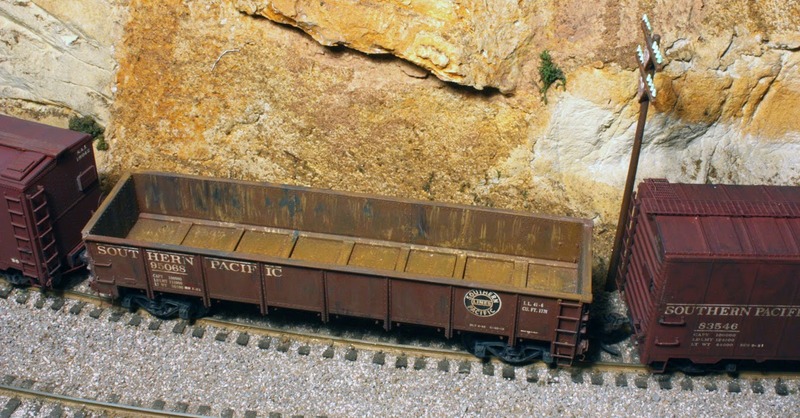 Some readers of this page will have seen the November 2014 issue of Model Railroader magazine, with several articles on weathering. The one by M.R. 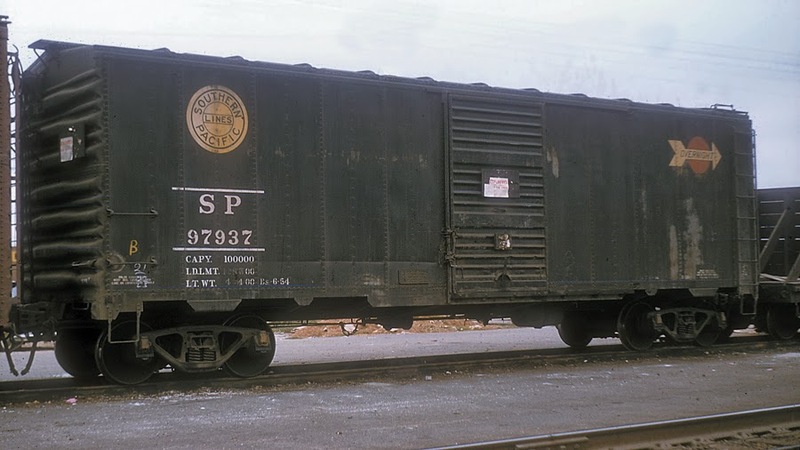 Snell on freight cars, curiously, only addresses covered hoppers, presenting three methods. One of these uses acrylic paint, not washes as I use, and really describes painting the car sides. This is a far different technique than I have been illustrating in this series. 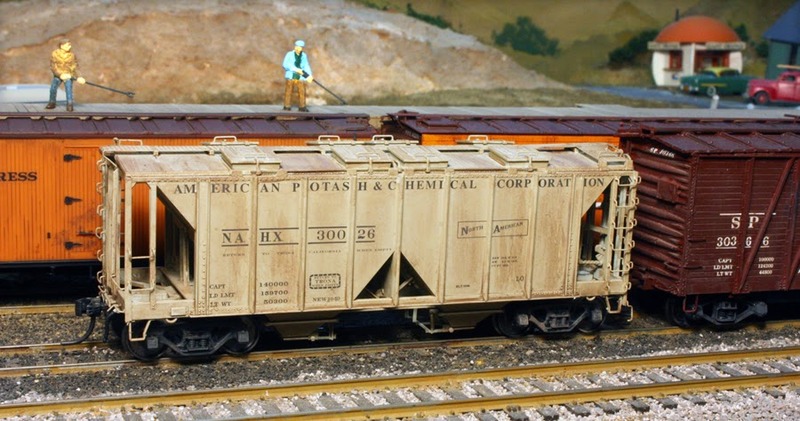 The next topic by car type takes up gondolas and hopper cars. In this section I take up open-top cars such as gondolas and hoppers. For them, I once again prefer to weather in two sessions, once to do the outside of the car (sides, ends and trucks) and again to do the inside. 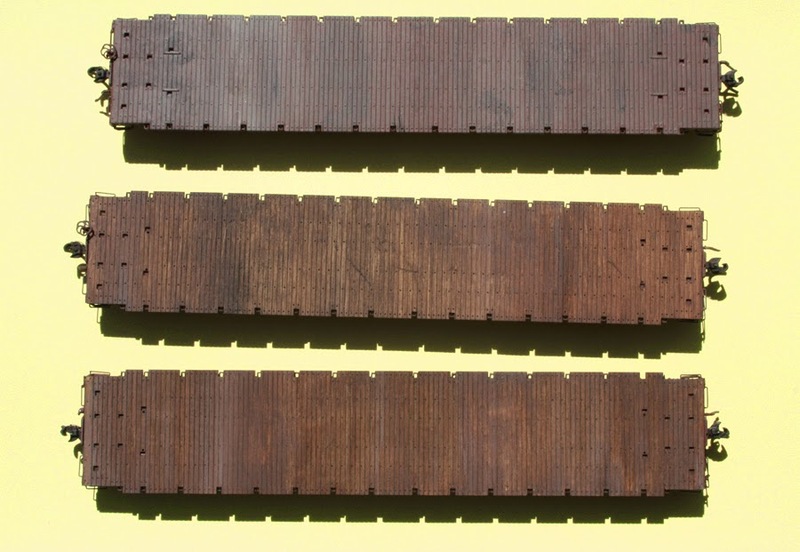 Insides are often different in wear patterns, degree of rust, debris, and other factors. The rest of the basic method is about the same. These different open-top cars give some idea of the kinds of approaches which may be useful for your own fleet. In this section, I concentrate on the problems of light-colored cars with my wash method. 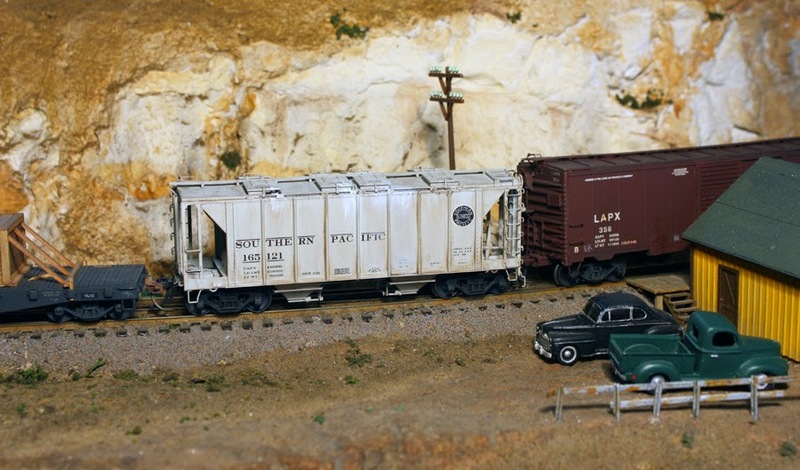 The most common type with such paint is the refrigerator car, but the same considerations apply to any light-colored car, including tank cars. 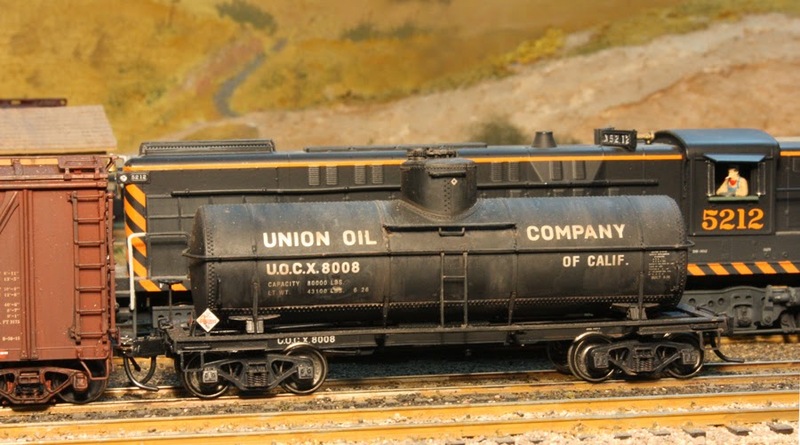 In this sectin, I discuss some of the details of the weathering process. These are all little things, but things that really can make a difference in how a model looks. All are based on prototype photos, and are part of the effort to reproduce what is seen there. 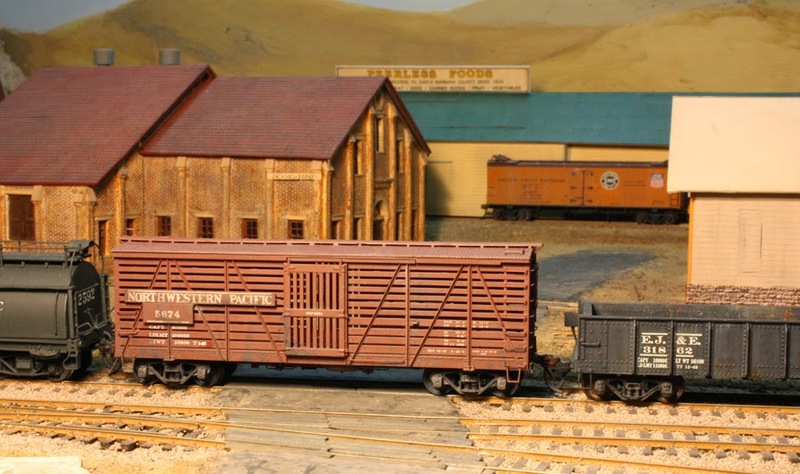 The use of pencils, as shown in these few examples, is just one of the ways to make weathering more detailed and more effective, particularly if it is kept subtle. Ideally the viewer likes the “look” of the model without being hammered over the head with specific effects, and that is the result we are striving for. I mentioned in the second section of the “basic techniques” page, that streaking of car sides with the wash, even though less evident after the whole process is complete, can be subtly effective. Here I mostly mean streaking caused by drainage of water off the car, especially the roof. 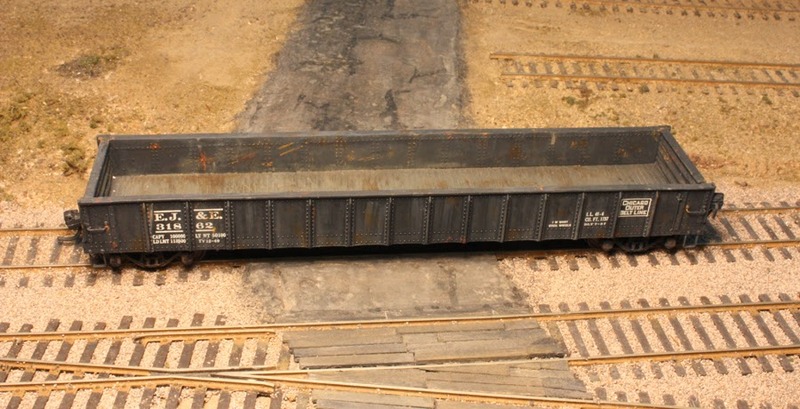 Here is another view of that being done, again prior to final weathering, when streaks like these will be somewhat muted. 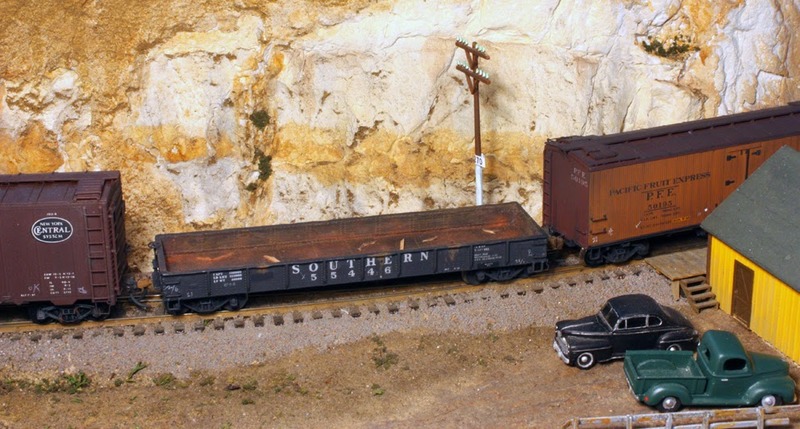 This is a Richard Hendrickson photo, from the weathering clinic we jointly designed and created, and then presented at several meetings, but what you see here is identical to my method. 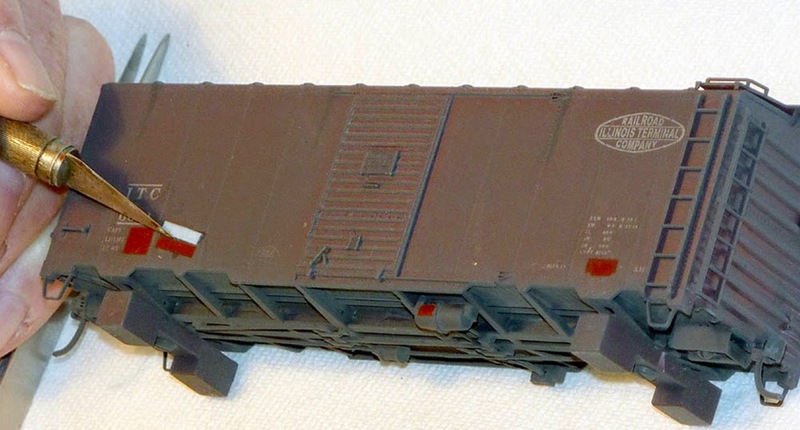 Subsequent weathering layers will subdue what may look like stark streaking at this point. 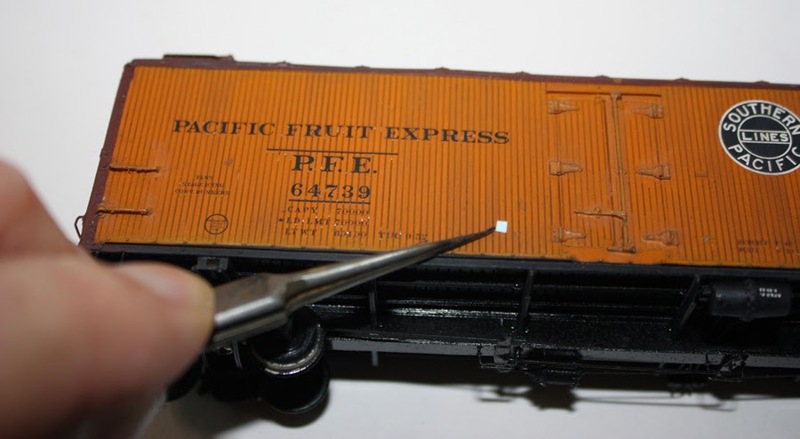 These details are among the things that make a routine sort of weathering job jump up to a higher level, and these details can really make a difference. 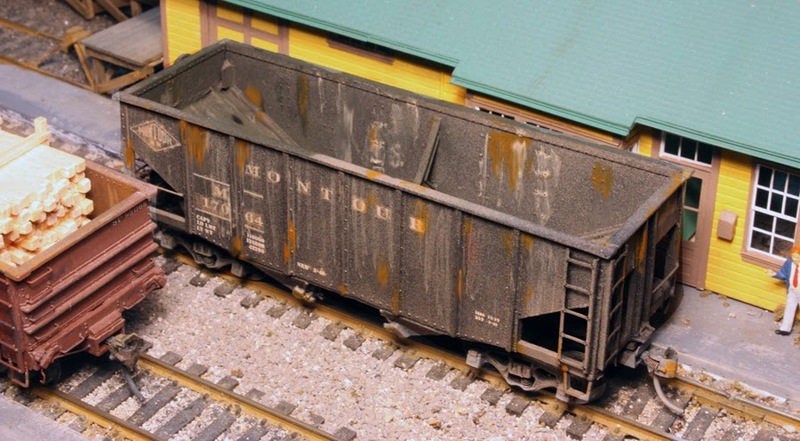 In section 10 I wrap up all the features of my acrylic weathering method in an overview. I have now completed my individual descriptions of aspects of the method I use with acrylic washes to weather rolling stock. This Part 10 is an effort to summarize all this material, and show comparative examples of some of the work. 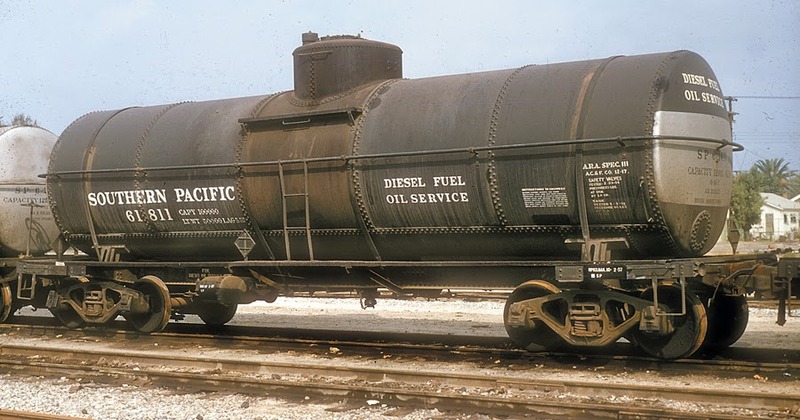 In Parts 2, 3 and 4, I showed work in progress on a Red Caboose box car, lettered for Southern Pacific, and I have had some viewers observe that the car does not look very weathered to them. Here is that car as completed, including a paint patch for the reweigh date. 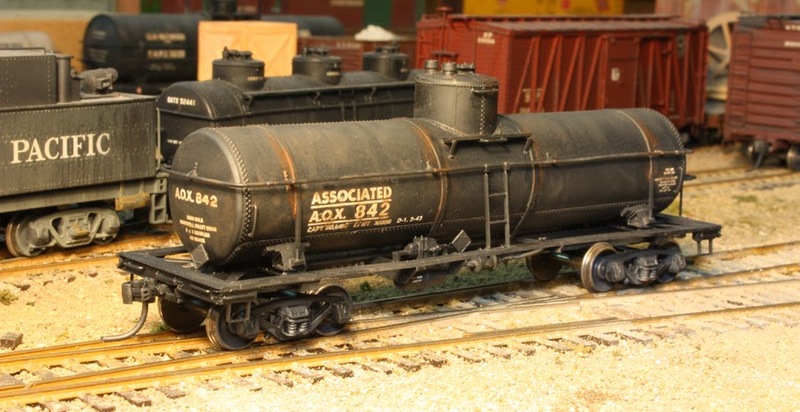 These examples illustrate some of the ways I want my model freight cars to look (of course, previous parts of this thread did so also). These four cases are not extensive, but I think they illustrate the general results of my weathering method. This concludes my summary description of the methods, both basic and detailed, that I use to weather rolling stock with acrylic washes.